Click here to view Studio A's calendar of upcoming events. On March 18 at the Australian Design Centre Lisa Scott presented an intimate showing of her very personal work. A delicate textile and text based dress inspired by the artists' lifetime of journal writing. Encompassing Lisa's vulnerability and courage, the work juxtaposes her fairytale dreams with the often unsettling reality of lived experience. “Lisa congratulations on your night tonight. Your Dress, inscribed with the words from your ongoing journals, is beautiful. Thank you for sharing your life with us. It is an important act and one that many artists cannot do as fluidly and beautifully as you do. Lisa writes as a daily practice. She writes about her life, her friends and family, about the many special occasions she shares with them and the many physical and emotional struggles she is faced with. Lisa’s writing is diaristic - detailing the minute details of her everyday. In working briefly with Lisa two years ago to re-imagine her writing and guide her to consider various new formal directions for her writing, I found myself appear suddenly on the pages as I entered Lisa’s life, and many of you who are here tonight will find yourselves there too. Lisa writes breathlessly, with little concern for the tug a war between now and then, past, present or future. In Lisa’s telling of it, life overlaps in messy and important ways. Something happy can immediately follow something sad. Hope can stand next to disappointment. Life can be dark and beautiful. This is something we can all understand. Lisa writes with great compassion and hope, she writes in order to, in her own words, make people understand what life is like for people living with a disability; how much harder they have to work and live and be understood. This is important work. Lisa does this work everyday through art making, through writing, through talking and thinking with others in her community. There is an emotional logic to Lisa’s work which traces lines of inheritance between Lisa’s past, her present and her future. 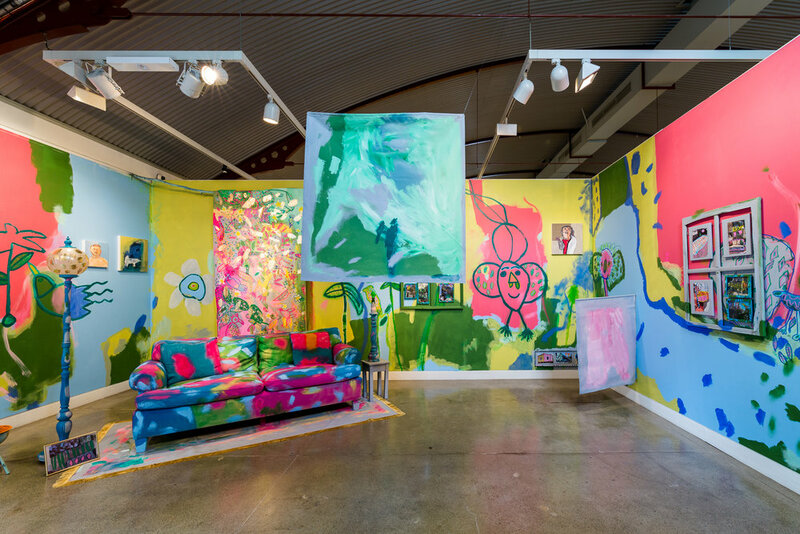 Sydney Contemporary is Australasia's premier contemporary art fair, showcasing the region's largest and most diverse gathering of local and international galleries. Held at Carriageworks in Eveleigh the Contemporary was held from Thursday September 13 until Sunday September 16. Studio A was curated into Paper Contemporary, Sydney Contemporary, featuring top modern and contemporary works of art on paper from leading galleries, print making workshops and art publishers within Australia, New Zealand and the UK. This year Studio A showcased the work of established artist, Peter Dudding. With over 80 galleries exhibiting the very best in contemporary art from established and emerging talent it was an art event not to be missed. Sydney Contemporary was busy, vibrant and a lots of fun. Best of all Peter Dudding's work was well received! In Collaboration with Sydney Contemporary Greg Sindel took over the Wedge Gallery space and front window display of Kinokuniya Sydney. Throughout the month of September Greg Sindel's original graphic artworks and some large format prints were on display, giving fans an opportunity to get up close to his playful and brilliant heroes and villains. Alongside Greg’s original paintings were a number of his clever sculptural pieces and editions of his published graphic novels. In celebration of Firstdraft’s exhibition Paired, curated by Harriet Body, Studio A presented Co-Lab. Studio A Co-Lab was an experimental activation of the gallery space that involved much more than just looking at art. Visitors saw Studio A artists at work, worked with Studio A artists and became part of the work itself. Thom Roberts was there to digitally remaster visitors' faces into an emoji, while hopeless romantic, Meagan Pelham guided guests in an ‘Owl Love’ drawing workshop before they discovered their comic alter ego as Greg Sindel drew out their inner super hero. Ringmaster and roaming performer Skye Saxon was on hand to keep everyone in line as kooky koala, Emily Crockford created chaos. And when the interaction goy all too much, visitors kicked back with a sausage sizzle and enjoyed live painting by Peter Dudding and Paul Williams. From 2pm special guests, Hack Sounds, a community-based and collaborative electronic music outfit for people of all abilities, played a special set. Paired was an exhibition of eight collaborative projects between artists living with and without intellectual / developmental disability or cognitive difference including three Studio A-supported collaborations – Thom & Angelmouse, Emily Crockford & Rosie Deacon, and Arunan Dharmalingam & Jessica Hodgkinson – alongside other nationally and internationally-based artists, Henry Jock Walker & Scott Pyle (SA), Dion Beasley & Johanna Bell (NT), Kate Adams & Paul Colley (UK), and Glenn Barkley & John and Glenda Havilah (NSW). As North Sydney's new kids on the block, we recently participated in our first ever TWT Block Party! The TWT Creative Precinct brings innovation and inspiration to the St Leonards area. Brand X is a non-profit arts organisation engaged to manage TWT Creative Precinct. Their focus is in the repurposing of spaces so that artists have a place to create new work. The TWT Block Party is a free annual event of exhibitions, performance, music and workshops for all the community, taking over the back streets and lane ways of St Leonards. Studio A took over a garage on Atchinson Lane with original art work on display, alongside Easter-inspired decorations and artists working and weaving on site. Sydney's newest contemporary art space, Cement Fondu, launched on Saturday 10 March, with an exhibition featuring some of Sydney’s most exciting artists, including artists from Studio A. Studio A-supported collaborative duo, Emily Crockford and Rosie Deacon created a vividly immersive installation over a two month residency in Cement Fondu's Project Space and Studio A artists Mathew Calandra, Daniel Kim, Thom Roberts, Peter Dudding and Annette Galstaun also contributed to the installation with a collection of portraits depicting select neighbours living in the vicinity of the gallery. First two installation photographs by Document Photography. The Studio A Love Launch was a party to celebrate our move to new premises in Crows Nest. The event also launched our 50/50 Fundraiser, which will continue until May 2018. Any donation made will be worth more than you can imagine thanks to Creative Partnerships Australia's Plus1 program that will match all donations made to our campaign – ultimately doubling your cash and impact! If you'd like to donate to Studio A, you can do so here.